This article describes how to download a UOB GIRO file and upload it to your UOB corporate account using our UOB bank integration. Before using this feature, make sure to call (+65) 6259 8188 to activate bank file transfer for payroll, or you will not be able to upload the payroll bank file. Please ensure that you're using a java-enabled browser before processing file upload. If you are not, please open Internet Explorer 11 and enable Java using the following steps. Make sure the Enable button is checked. If the BIBPlus file upload system is still showing that you're using a non Java-enabled browser, please proceed to download and install Java. Upon Java installation, restart your browser and you should be able to upload your file. 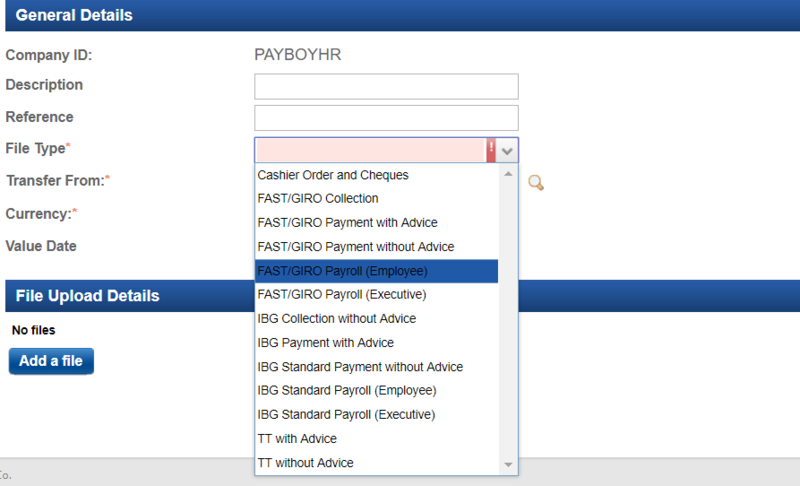 After which, move your cursor to the left side bar and expand the "Create Bulk Transaction" > Select "File Upload"
Fill up the relevant Description, for File Type*, select from the drop down box "FAST/GIRO payroll (Employee)"
* if you do not see this option within the drop down box, please contact uobgwbclientservice@uobgroup.com to assist you in opening up that option. Select the bank account you want to transfer from on the Transfer From* column and adjust the value date as per desired. Click on the "Add File" button and upload the file downloaded from Payboy.